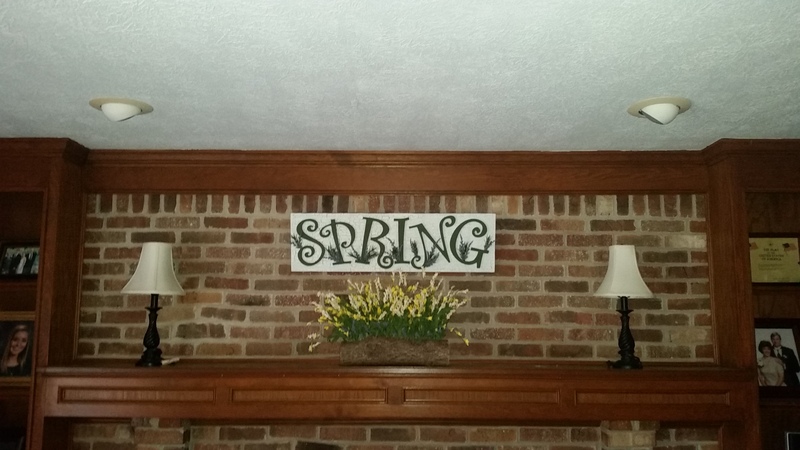 This Spring I wanted to create a special mantel decoration. 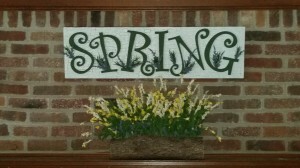 I decided to recycle an old seasonal sign that I had previously made. The MDF board had several layers of paint and even though I had removed the previous decorations the surface still had a very rough surface and I sanded the board to try and remove most of the paint. 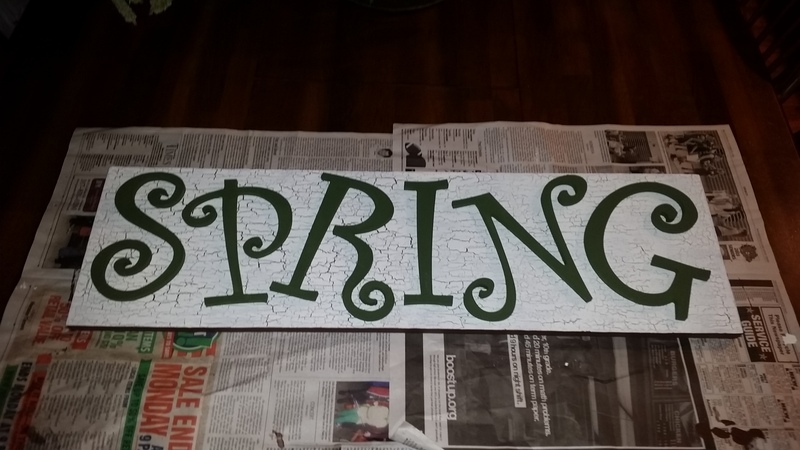 Also to solve the problem of the uneven surface I decided to use a crackle medium paint. 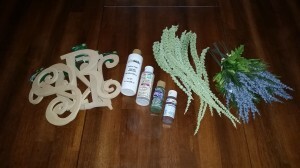 List below is a list of the craft project supplies I used and also complete instructions. Cut the MDF board to size, this is determined by the size and spacing of the wooden letters and the space in which it will be hung. 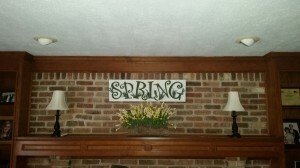 For more information about the Spring floral arrangement seen on the mantel in the photos, please click on the link to the Spring Mantel Decoration Craft Post. 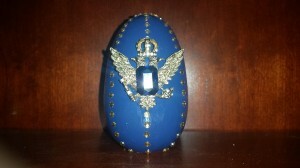 Inspired by the Fabergé Eggs, I decided to create a Fabergé Egg craft project. 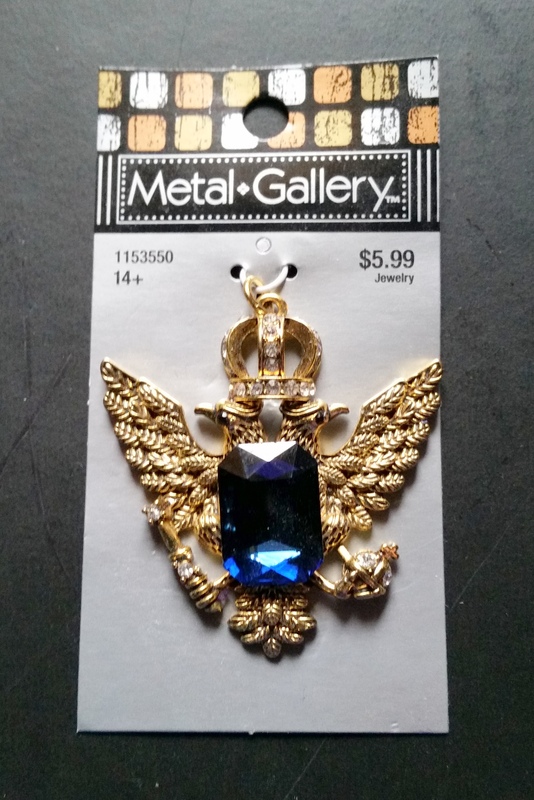 This idea started when I found the double eagle pendant in my local craft store. 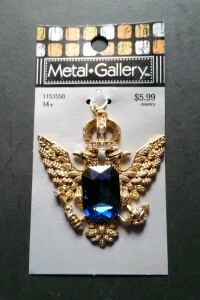 The golden eagle pendant has a large blue gem set in the center and accented with diamond-like crystals. 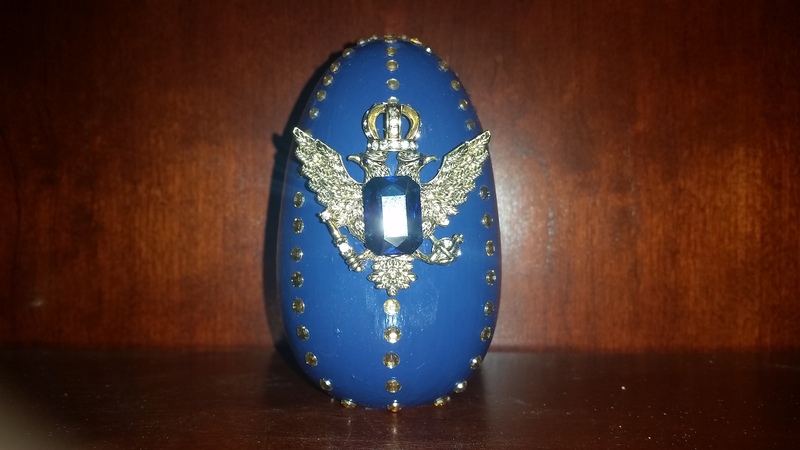 I thought this pendant was a perfect inspiration for an Imperial Fabergé-style Egg. 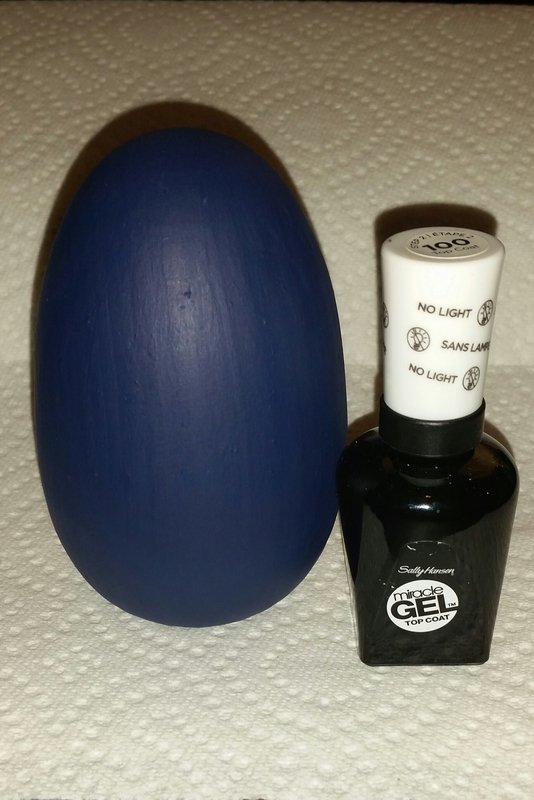 Start by using sandpaper to smooth any rough edges to prepare the wooden egg for painting. To complete the craft project, hot glue the “inspiration piece” to the egg. A few years ago my mother gave me a bag of old pennies that my father had saved. Now that both my parents have passed away I wanted to do something special with them. So, I searched the internet and came up with a few ideas and in this post I will show the four different craft projects that I made using the pennies. 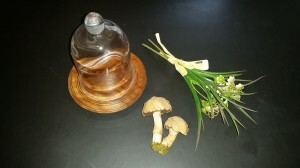 The first project uses a tray that I had previously made which was detailed in another post on this blog a few years ago. 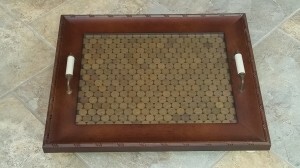 Making the tray was a very simple craft project using a picture frame, decorative drawer pulls and knobs. 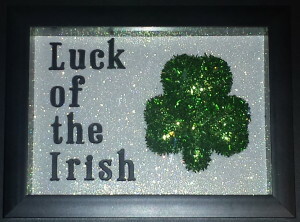 Now, I decided to embellish the tray with the pennies from my dad. 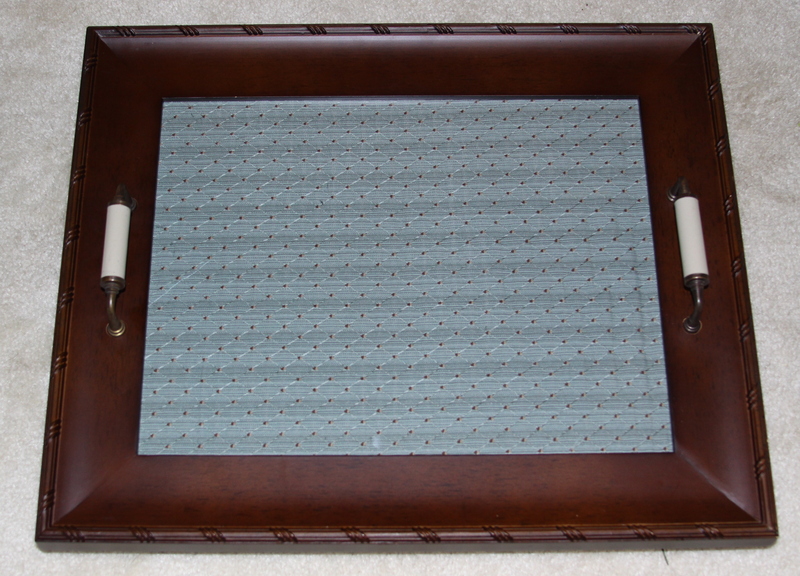 Remove the cardboard backing and material from the picture frame tray, leave the glass in place. Glue the material to another piece of cardboard, this will provide additional support to carry the weight of the pennies. Glue the pennies directly on to the material. Line the pennies with all of them facing the same direction for a more uniformed look. 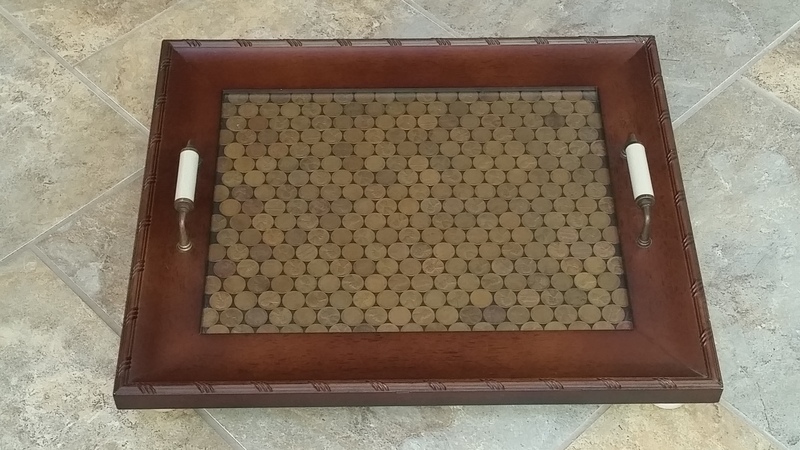 After the pennies are arranged, carefully flip the material/cardboard piece with the attached pennies and place into the picture frame tray. Replace the cardboard backing and secure. 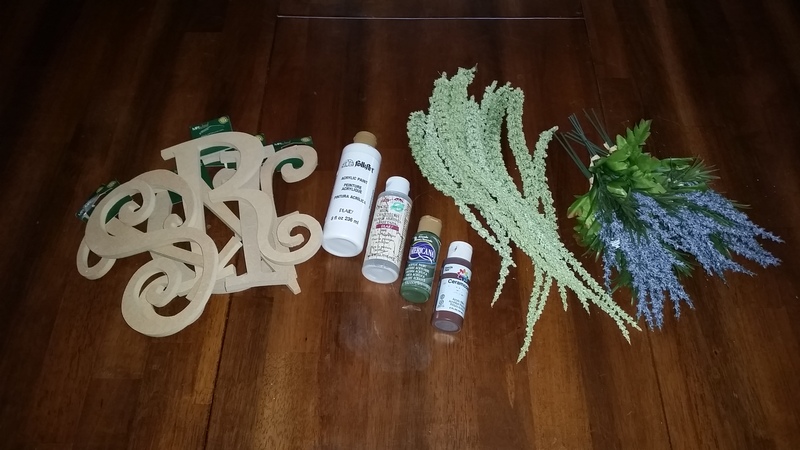 The next three craft projects involve items that, when they are completed, can be used as decorations for a home. For this next craft project I found a special poem on the internet. I printed it out using my home computer, notice the poem is positioned in the upper portion of the paper to allow space. In the lower portion the paper I arranged the pennies into a heart shape. 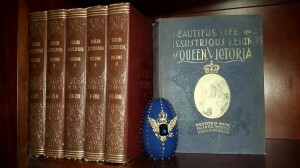 This piece would look wonderful hung on the wall of a home or set in a bookcase or on a table. Print a special poem on the computer (I suggest a short poem printed in the upper portion of the paper) For additional support to hold the weight of the pennies glue the paper with the poem onto a piece of heavy cardboard. 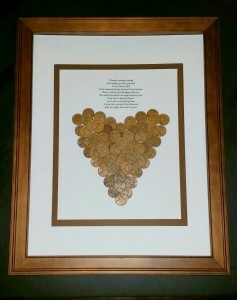 In the lower portion of the paper glue the pennies to form the outline of a heart shape. 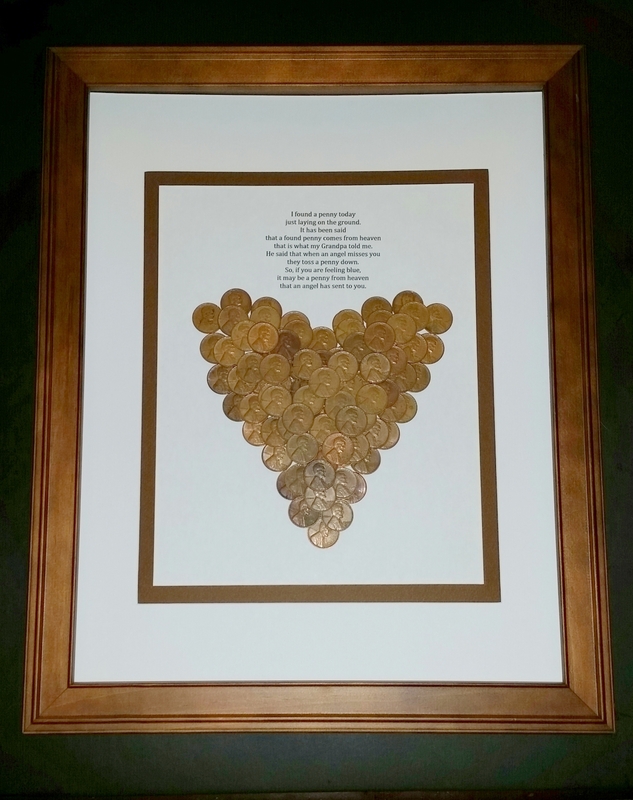 Then, continue to fill the space within the heart outline and overlay several layers of pennies. I placed the pennies with all of them facing the same direction for a more uniformed look. 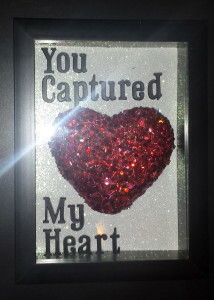 Remove the cardboard backing from the frame; insert the special poem/penny heart and center within the photo mat. Craft Tip: In order to avoid flipping over the paper weighed down with the heavy pennies instead lay the paper flat on a hard surface and then place the frame over it. Then flip the entire frame over, by doing this it will allow the heavy paper some much needed support. 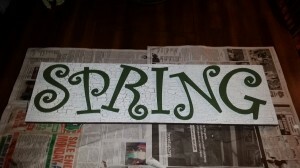 Replace the cardboard backing to complete the craft project. 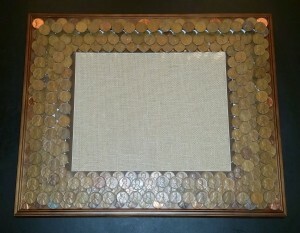 This craft project was created with the remaining pennies that my dad had saved. 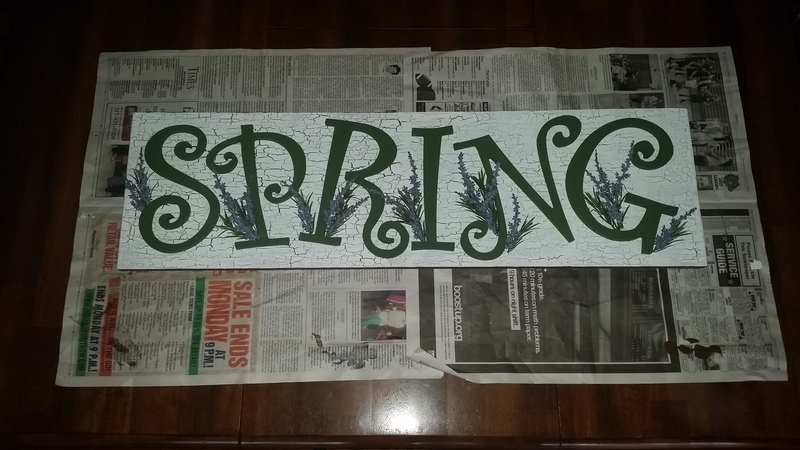 In my local craft I found a fabric covered board which I used for this project, this board would prove to be an excellent item to support the heavy pennies. 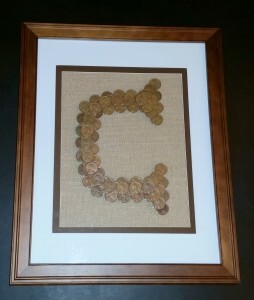 On the fabric covered board glue the pennies to form an initial. Then, continue to overlay several layers of pennies. I placed the pennies with all of them facing the same direction for a more uniformed look. Remove the cardboard backing from the frame; insert the fabric board/penny initial and center within the photo mat. For the final craft project I wanted to incorporate a photo into the design to create a unique decorative item to remember my dad. 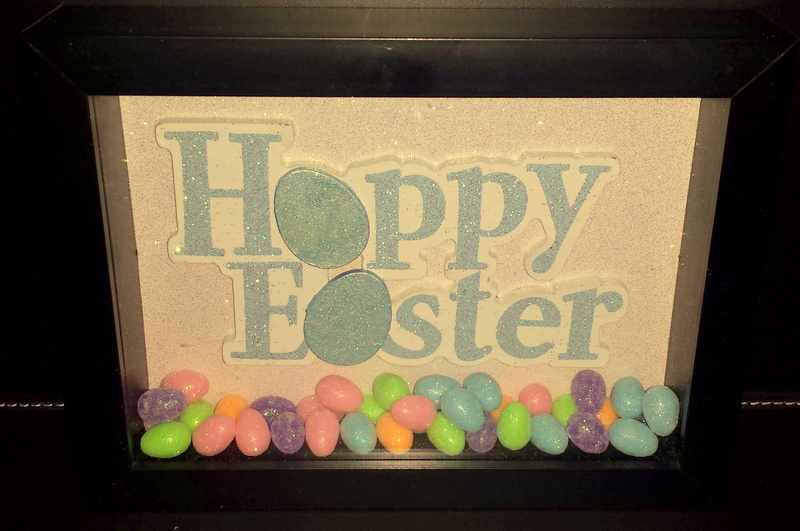 I decided to use a simple picture frame which I embellished with the pennies that my dad had saved. 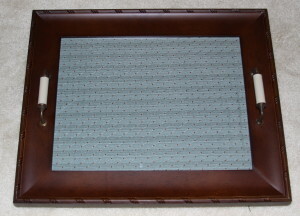 Remove the cardboard backing, insert the selected photo and position into the photo mat, then reassemble the frame. Start by gluing the pennies around the edge of the frame (I placed two layers on the frame overlapping the layers) I placed the pennies with all of them facing the same direction for a more uniformed look. 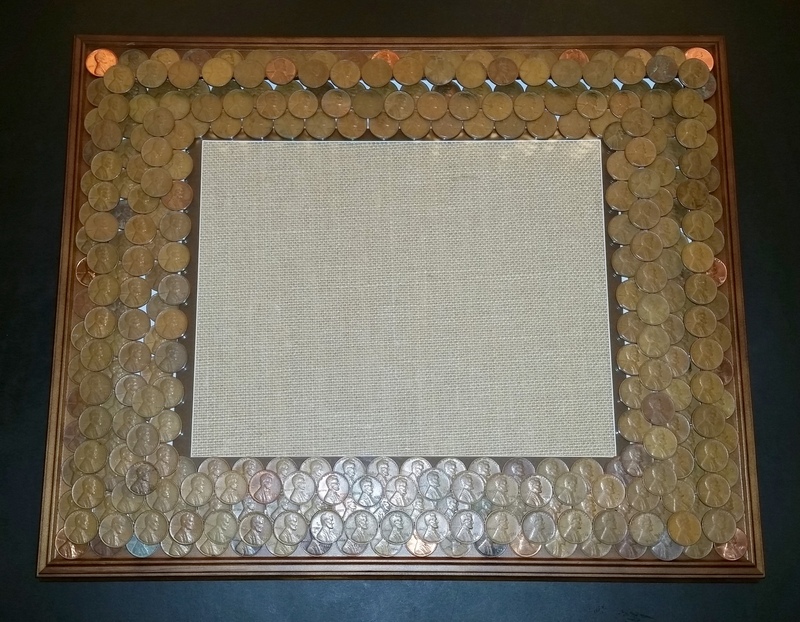 Next, glue the pennies directly to the glass starting at the edge of the frame and working toward the edge of the photo mat covering the entire area while overlapping the different layers. In previous crafts posts I have used domes or cloches to create decorative displays under glass. 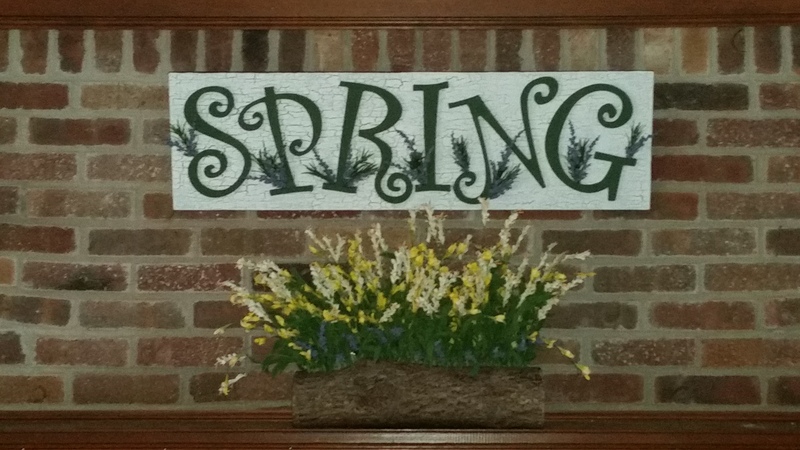 These craft projects make wonderful displays for any home and can be used on tables or bookshelves as decorative Spring or Summer seasonal items. 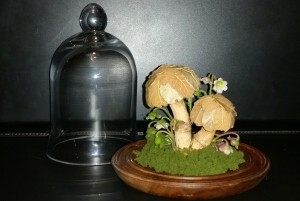 In this post I will create another simple display using mushrooms, floral stems and moss. 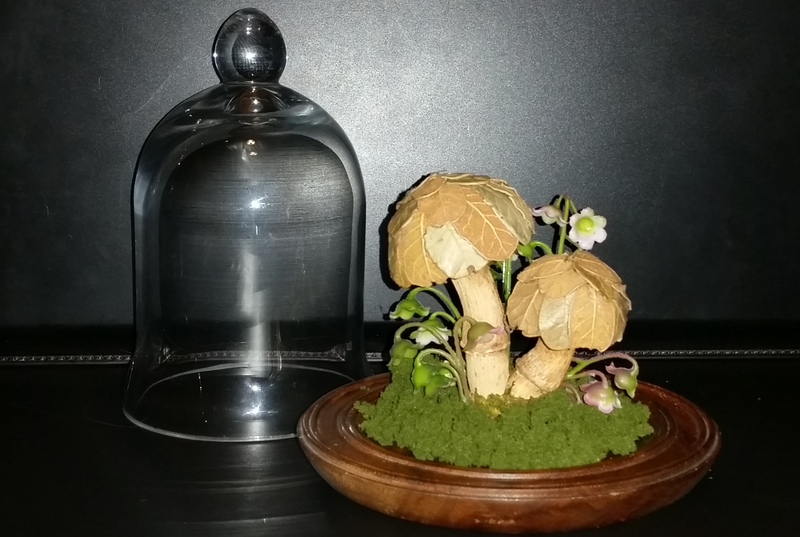 Additional items, such as an artificial snail or a couple of ladybugs or a butterfly perched on one of the mushrooms or maybe a tiny sign that says “snail crossing” or “welcome to the garden” and decorative rocks can also be added to create interest. 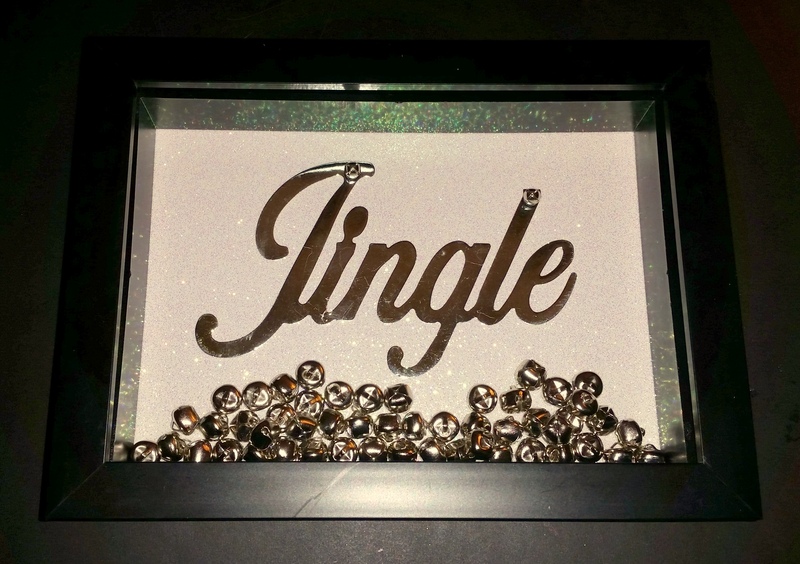 Optional items can be added to the display to create more interest, such as an artificial insect or a small sign. 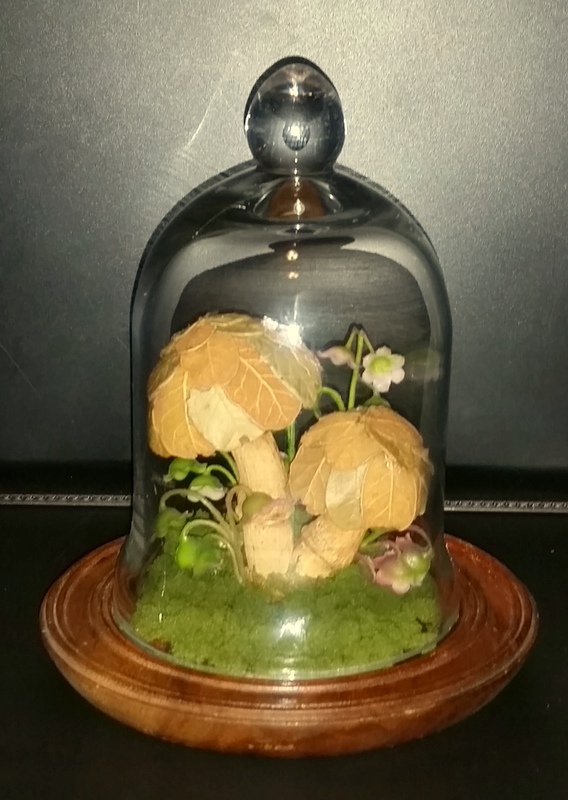 For more information about the previous crafts posts, Butterflies in a Jar and Fairy Under Glass, also using domes or cloches to create decorative displays under glass, please click on the links for supply lists and full instructions. This year I did a craft post on a trio of Valentine’s Day themed shadowboxes; if you are interested please click on the link for more information regarding a supply list and complete instructions. So, inspired by that craft project, it gave me the idea to create a series of shadowboxes for the various holidays throughout the year. 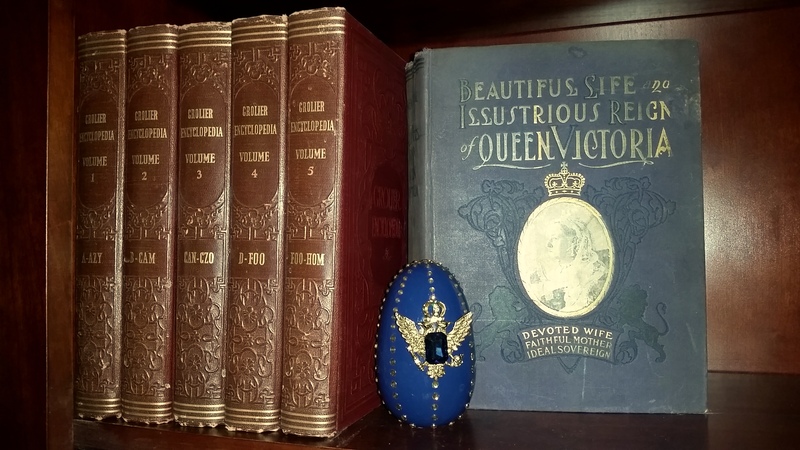 For uniformity, I used the same black shadowbox and change the items for each example. 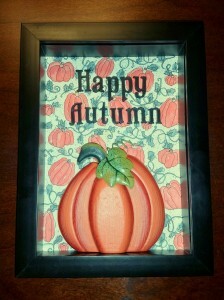 In this way I created a decorative shadowbox that can be used for a variety of different holidays that can be placed on a desk at work or home and on a bookshelf or side table in the living room or on the kitchen counter. Disassemble the shadowbox, remove the backing. Using the cardboard backing, trace the size onto the scrapbook paper and cut. Attach the seasonal or holiday item(s) to the scrapbook paper using hot glue, allow time to dry completely. 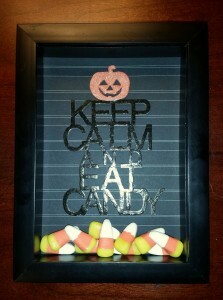 (Option) Using the self-stick letters, spell out an appropriate message and attach letter to the glass front. Shown below for Valentine’s Day are two different shadowboxes; in version #1 (on the left) I used a white sparkle scrapbook paper, a red sequin heart and black self-stick letters that spell out “You Captured My Heart” attached to the front of the glass of the shadowbox. 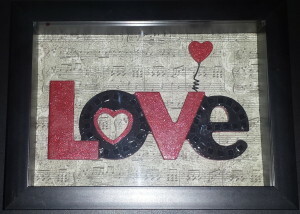 In version #2 (on the right) I used a wooden item that spelled “Love” which I painted red and black with self-stick black sequin and a coordinating scrapbook paper. Shown below for St. Patrick’s Day, I used a green sequin shamrock, white sparkle scrapbook paper and black self-stick black letters that spell out “Luck of the Irish” attached to the front of the glass of the shadowbox. 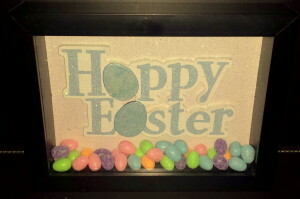 Shown below for Easter, I used a scrapbook item that said “Hoppy Easter”, white sparkle scrapbook paper and several small sparkle eggs. 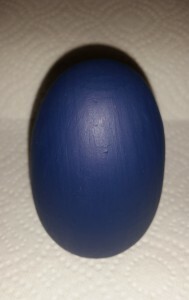 The eggs are loose, so for added interest, if the shadowbox is shaken the eggs would move much like a snow globe does. 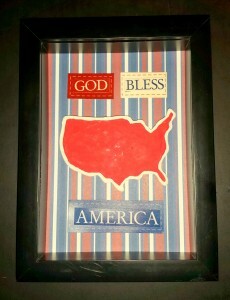 Shown below for Fourth of July, I used red, white and blue striped scrapbook paper, a magnet that I painted in red with a white border and scrapbook items that spell out “God Bless America”. 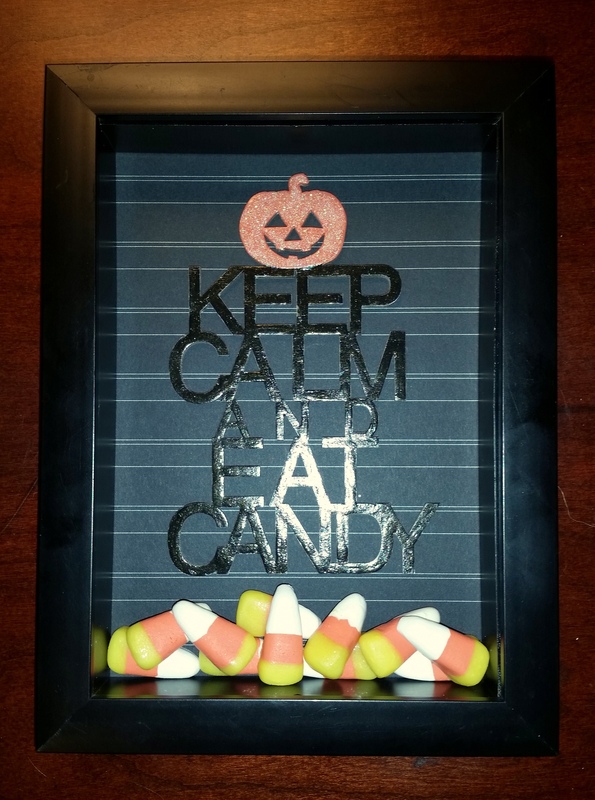 Shown below for Halloween are two different shadowboxes; in version #1(on the left) I used black/white stripe scrapbook paper, a painted wood piece that says “Keep Calm and Eat Candy”. The resin candy corns are loose and, much like a snow globe, when shaken the candy will move. 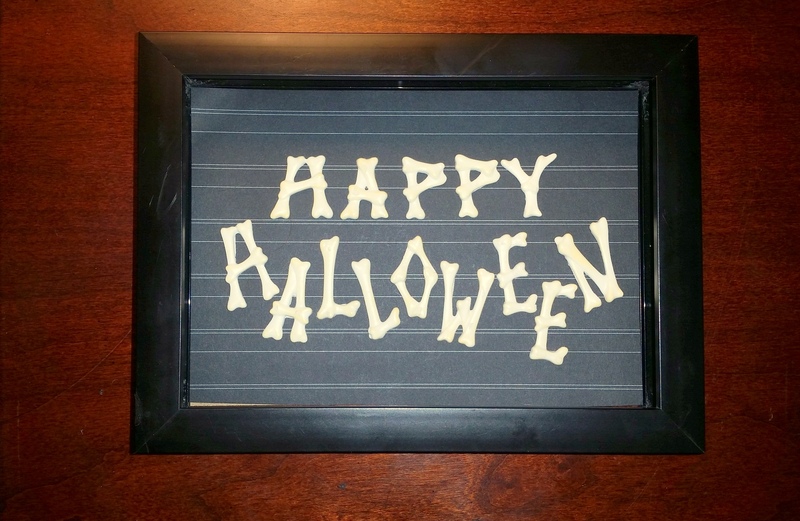 In version #2, I used the same black and white scrapbook paper and I found another scrapbook item that are plastic bones that spell out “Happy Halloween”. 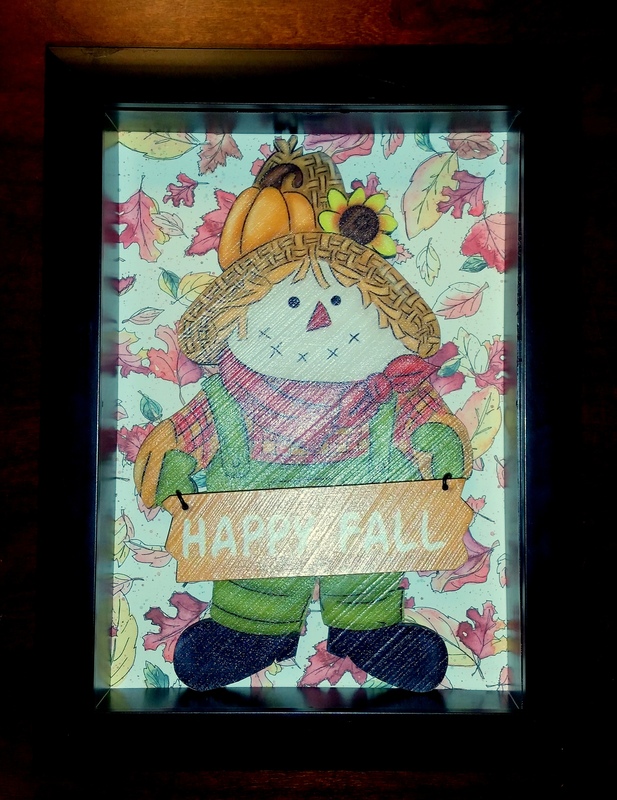 Shown below for Thanksgiving or the Autumn season are two different shadowboxes; in version #1 (on the left) I used a wooden scarecrow and festive scrapbook paper with autumn leaves. 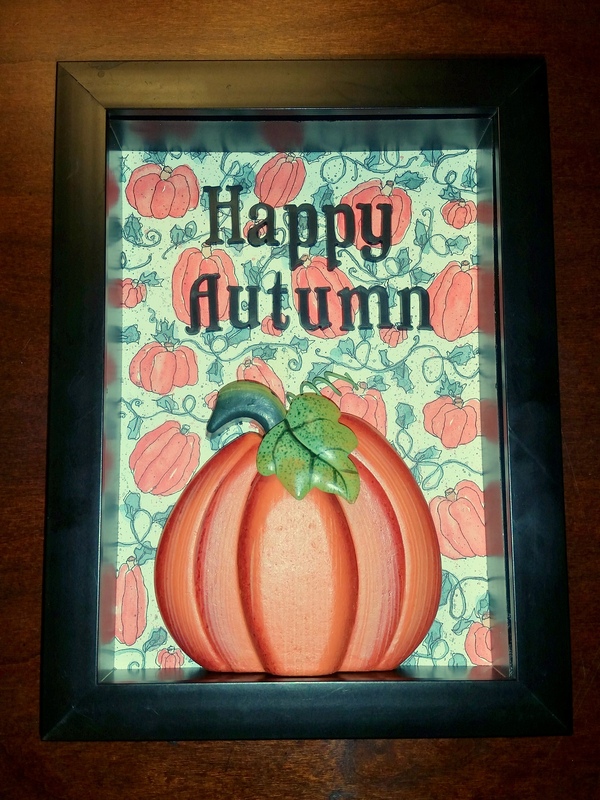 In version #2 (on the right), I used a wooden pumpkin, scrapbook paper with more pumpkins and black self-stick black letters that spell out “Happy Autumn” attached to the front of the glass of the shadowbox. 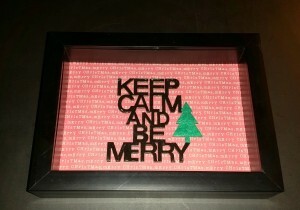 Shown below for Christmas are two different shadowboxes; in version #1 I used red scrapbook paper that says “Merry Christmas” and a wooden piece that says “Keep Calm and Be Merry”. 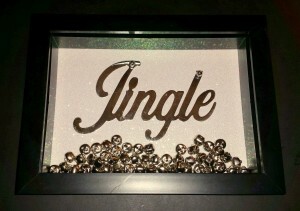 In version #2, I used white sparkle scrapbook paper, a silver piece that says “Jingle” and several loose silver jingle bells for added interest so that if the shadowbox is shaken the bells would move much like a snow globe does.